You've probably read by now that Disney on Thursday struck a deal with Hulu, the online video site. That means you can watch a bunch of ABC shows - everything from "Lost" to "Desperate Housewives" - for free at Hulu.com. NBC and Fox already put content on Hulu. Here's some background about what this means for online video sites, and for the future of TV. Let me know what you think of the deal in the comments. Do you use Hulu? What this all means is there just aren't that many other places for YouTube to acquire high-end content. "(The Disney-Hulu deal) is not good news for YouTube," said James McQuivey, an analyst at Forrester Research. "Any hope of creating a professional-content business has probably disappeared." A YouTube spokesman issued this positive-spin statement: "More content coming online in more places is a win for consumers and provides further validation of the growth of the online video market." The new setup also brings the owners of three of the four major broadcast networks - ABC, NBC and Fox - into a fight for online eyeballs against the video streaming site TV.com, which CBS Corp. acquired last year when it bought CNET Networks Inc. for $1.8 billion. 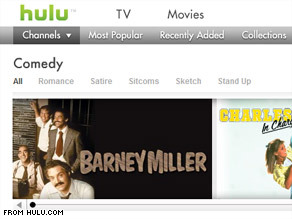 In February, Hulu pulled all its content from TV.com. The move, though not unexpected, marks a victory for Disney and its ABC television programming: Not only does the deal erase NBC’s and Fox’s early-mover advantage over ABC, but Disney’s Hulu deal appears a bit sweeter than those of the other networks because it requires them to make only certain episodes from a series available on Hulu at any given time. The first taste may be at Hulu, but the full meal will still be on Disney-controlled real estate. Hulu, which in the last 18 months has become the third most popular video site on the Web, behind YouTube and Fox Interactive Media, displays free, high-quality versions of television shows and movies, supported by advertising. For more on Hulu, see the site's "about" page. Hulu is not a "video-sharing site". Users can't upload their own videos. I watch shows on Hulu all the time. I do not like to watch the network TV while it is on the TV because it seems that there are more commercials than programming. With Hulu you only have three or four commercials and I am much happier waiting through just one commercial at a time than five or six like on the TV. As long as the site remains free to the customers and there are no more then one commercial at a time I think that I would be happy to continue to watch the programs on Hulu. And for You Tube... booo hoooo. Finally have some competition! That is what makes big companys come up with new ideas to bring in viewers, and if the site goes down hill... well guess you need to re-think something don't you. Yay for Hulu! If they can sign on CBS as well then I can throw away my TV! What will happen to this shift in media when companies like Comcast and Time Warner follow through with their plans to place limits on monthly megabyte usage? The arguments these companies are making for the necessity for limitation are incredibly weak. It is time these companies invested more in their infrastructure before simply hoping that placing limits will solve an overcrowding problem. The competition's commercials that make fun of the idiotic cable company executives are dead on. "It is time these companies invested more in their infrastructure before simply hoping that placing limits will solve an overcrowding problem. The competition’s commercials that make fun of the idiotic cable company executives are dead on." I have been watching TV shows on Hulu for less than six months and I've come to rely on it to watch good shows that I previously never watched like Heroes, Lost, Lie to Me, and Revenge of the Seeker. I don't have time to catch something each week and would rather watch a bunch on a particular day when I do have time and am in the mood. Of course I like the Disney deal since it means even more content. If my ISP puts megabyte limits on me so I can not use the online TV, I'll just have to live without it. Like I did before. They may think I'll be forced to subscribe to cable TV but that would be a mistake. Time warner needs to start replacing the old cables with fiber optical connections. smartest thing i've done? cancel my cable! $130+/mo for "HD package" is gone! Hulu is awesome! i can deal w/ the small commercial breaks, it's free & most of my shows play there & i can queue them up to play how i want (kinda like dvr) – i even get notices when my favorite shows are in my queue. Hope is stays free for a long time & get CBS next! You Tube and Hulu content is not comparable. One is a video sharing site, the other show commerically produced entertainment, legally. Hulu in HD would be nice. @Kevin – you nailed it with that comment. Comcast's bandwidth limitations are nothing but an illegal bait and switch in my mind! Can't wait for fiber optic to make it to my house so I can drop Comcast. I know personally that I prefer Internet over Cable TV any day because I am getting only the content I want. Sites like YouTube and Hulu offer me the ability to view not only current TV but also vintage and out of date content that I would never be able to find anywhere else. It's all just a click away and I can encompass all my entertainment in one package online and one bill. Cable costs were up to about $70 a month for expanded cable in our area and I only watch 2% off all the channels offered. So online content is the clear choice for consumers and I beleive "a death bell" for Cable conglomerates. I love Hulu. You can tell friends about great high resolution Today Show interviews and let them watch it when it's convenient for them. Appreciating the dedication you put into your site and detailed information you present. It's great to come across a blog every once in a while that isn't the same outdated rehashed information. Excellent read! I've bookmarked your site and I'm including your RSS feeds to my Google account. Best quality memory flex glasses and glasses that you can find online.